Happy unofficial start of summer to you! Now is the perfect time of year to look outside at the bright, sunny skies and warm breezes and... close the blinds, lay in bed and read a good book! God, AC is a great invention. Summer is an amazing time. 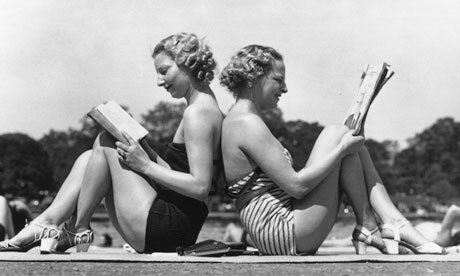 Tons of new books come out in the hopes of catching people vacationing or heading to the beach. There's more daylight to read by and when it gets too hot staying inside is the best course of action. This is a great season to spend some quality time with your To Be Read pile. As you know, the 52 Book Challenge states you should read about a book a month to be on pace. This is the 22nd week of the year so tell us what your number is! I just hit 22. I got a little lazy there for awhile but I am back with a vengeance and I read three books last week alone. My Kindle and I are really getting close. I've slammed through Revision by Andrea Phillips, Three Slices by Kevin Hearne, Delilah S Dawson and Chuck Wendig, as well as Of Noble Family by Mary Robinette Kowal. My nightly re-reads have been derailed for the past few months but I intend to get back on that horse with a summer re-read of HP Lovecraft stories. So tell me, how many books have you read so far? Are you on pace to complete the 52 Book Challenge? Read anything good lately? I just hit 36 books! I can barely believe it! Although I have been including audiobooks as well. I've been trying to read Lovecraft for awhile now and I'm finally making some progress. It is good fun to read such kind of books.